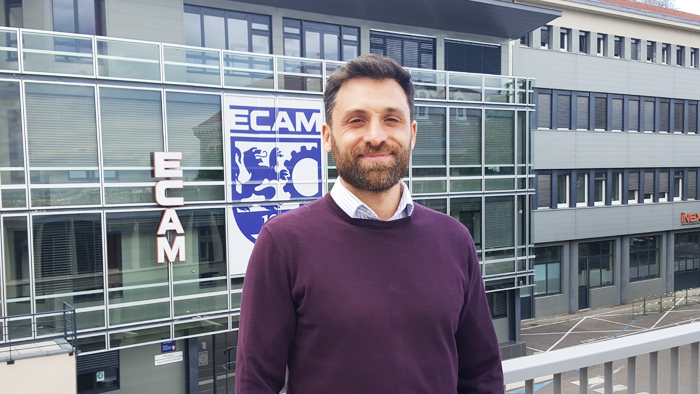 This week, ECAM Lyon hosted Stefano Longo, a senior lecturer at Cranfield University (UK). He held several conferences for engineering students from the Arts & Métiers program in French and the Engineering program in English . His main research focuses on advanced vehicle control. What do you teach at Cranfield University? I teach automotive engineering and more specifically electric cars and autonomous vehicles. I manage two programs, the MSc in Automotive Mechatronics and the MSc in Advanced Motorsport Mechatronics. Part of my job also involves research. My research deals with developing advanced control algorithms for vehicle optimization, and implementing these algorithms on on-board equipment. What is the purpose of your visit at ECAM Lyon this week? Thanks to the European Union, faculty can benefit from an ERASMUS grant in order to pursue educational projects abroad. As ECAM Lyon is a long-standing partner of Cranfield University, I naturally reached out to their teaching team. Seminars will mostly be addressed to the ECAM Engineering program students, but faculty and students from the final year of the ECAM Arts & Métiers are also involved in these conferences. My visit to the ECAM Lyon campus will also allow me to inform ECAM students about the many possibilities that we offer at Cranfield University, such as classes, research, and campus life. Every year, our University welcomes several students from the ECAM Arts & Métiers program as part of an academic exchange. We are working to expand this partnership to ECAM Engineering students for their Double Degree program. Why is it important to teach these specific subjects to future engineers? With climate change, excessive CO2 emissions from cars are becoming increasingly scrutinized and is an urgent issue for our future. Producing more electrical cars will be part of a true ecological commitment. Automation is an important topic as well. We believe that there will be fewer accidents when cars will become more autonomous, because around 90% of road accidents are due to human error. Some people fear that massive automation in various fields, such as the automotive industry, could cause higher unemployment. I believe that it will create and add new jobs such as programmers. All of these issues contribute to evolutions in society and the labor force. In the end, these developments, and the use of robots, could allow us to reduce work time and improve living conditions. What are you planning to discover during you stay in Lyon? I was advised to taste the local gastronomy! And, of course, to discover the neighborhoods of this amazing city!